Continue north about 2 km along Gladstone Rd to the Poulton Drive parking area. Cross the stile and follow a poled route for half an hour along an unfenced right-of-way through private land that crosses the Makahika Stream. You reach the Tararua Park boundary and an information sign. Across the river is the former sawmill site. At a grassy open clearing amidst native bush about 1 hr from Makahika Camp prime minister Helen Clark unveiled a plaque commemorating the opening of the track in 2008. There is a toilet here and it makes a nice place to camp. The trail then follows the former tram-line route with benched track and cuttings clearly visible in many places. Near the terminus of the Makahika tramline formation the Bartholomew Timber Company ended native logging in this area of the Tararuas in the early 20th century. The track departs from the tram-line at right angles at a large orange marker and climbs steadily to the Makahika Ridge at around 650m, with first Kapiti Viewpoint (Archey’s Lookout) and then Horowhenua Lookout, a small cleared area with seating. Then there is a gradual descent, veering to the north, passing an area of revegetating manuka on land that was once farmed. After crossing the three tributaries of Blackwood Stream (named after the black beech in the vicinity) there is another ascent and you pass some fine examples of large rimu trees that escaped the bushman’s axe. You could potentially camp around here. On the descent following you come to an information sign and then a car park. Follow the road north along the edge of the Tokomaru No. 3 Reservoir (lake) 2.5 km to the junction of Tokomaru Valley & Mangahao Roads, then turn downhill on the Tokomaru Valley Rd. Despite the lake, the whole valley is rather unattractive and there are really no camping options in it. It is about 40 mins along the unsealed country roads to a rusty white gate that marks the beginning of Burtton’s Track. After the gate on the left are some dilapidated buildings and a few hundred metres further on is a new hut built by the NZ Defence Force for the TA Trust. As of mid-March 2019 it is not quite finished, but it has a roof and walls. James Burtton was a farmer who purchased a cheap block of land in the Tokomaru Valley in 1908. The local council refused to pay for constructing a road to his farm, so he did it himself with explosives and pick and shovel. The track begins as an easy, mostly level, benched route of good width through regrowth bush, following the Tokomaru River. After about 1.5 hrs nice grassy camping spots start appearing by the track. These include one at the site of Burtton’s whare (bush hut), located within grid reference 1814/5509, just before the first track is shown on the TA map going uphill across the river. The site of the former swing bridge that crossed to Jim Burtton’s farm on the western side of the river, and that killed him in 1941 when it collapsed, can be seen. You may see a cottage on the other side of the stream. However, THIS IS A PRIVATE RESIDENCE. Please stick to the marked route (do not cross the river) and continue south. The trail here goes over private land and this arrangement requires the owner’s goodwill for it to continue. After a few more grassy clearings the track crosses the river. There is a large orange triangle on your side to mark the crossing, but only an obscured small one well downstream to mark the point where you rejoin the track. By now the route has ceased to be the easy wide track made by Burtton and is a regular tramping track. It makes a long climb uphill to about 500m to finally exit at an exposed grassy spot. You could camp here but a more sheltered spot is beside the track 10 minutes further on, though neither has water and both are on private land. The total time to do all 13.5 km of Burton’s track is about 4 hrs 15 mins. The track goes downhill on a 4WD road from the stile and DoC sign at the end of Burtton’s Track. From regrowth native bush you change onto forestry roads through ugly broken country covered with the pine plantations of the Gordon Kear Forest. As at 2017, after harvest and with saplings only a few years old, the landscape is one of visual desolation, but this will improve as the trees grow. Go downhill, keeping to the left at each junction. The route from here all the way to Palmerston North is generally well-marked with TA signs. (As of March 2019 a shelter is being built at the junction of Toko Corner Rd and Centre Rd by the Palmerston North City Council within the Gordon Kear Forest. This looks like it will be a picnic shelter with camping spots, toilet and water and it could be a real boon for hikers in the 2019/20 season as there is no other legal place to camp in the forest and it is nicely placed at 28 km from Palmerston North.) At the bottom of the Gordon Kear Forest roads there is a locked gate and a stile and then a climb up a hill to intersect with Scotts Rd. Keep going ahead, not left, on what is now Scotts Rd, winding around the side of the hillside with mature pines below the road and farmland above. You will reach signs for Back Track on the left. Back Track is a wide, easy track used by mountain bikers, so watch and listen out, especially in weekends, as they come hurtling down. There are a few streamlets crossing the track whose water should be good to drink. 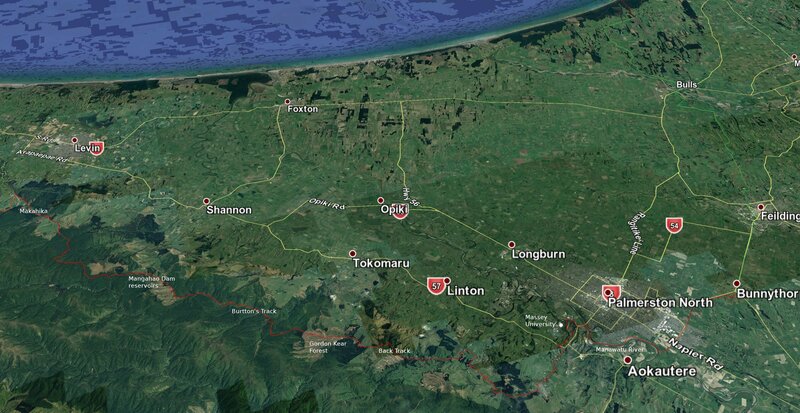 It is a steady descent, mainly through native bush, with some pine forest above, but also open farmland that allows good views over the Manawatu. At the bottom, cross Black’s Bridge to arrive at a large car park and picnic area with toilets. You could possibly camp here, but it may be frowned upon and there are better places further on. The route heads now down Kahuterawa Rd following the Kahuterawa Stream. There are some nice looking camping spots along the stream about 15 mins from the car park but they are probably on private land. However, 40 minutes from the carpark there is the Kahuterawa Reserve picnic area. This is an excellent camping spot and camping is explicitly permitted. Further on, turn right into Greens Rd and follow it uphill and then down through open farmland. Take the gravel road/track that descends gradually through native bush from the end of Greens Rd for 35 minutes. Watch out for mountain bikes on this track. At the bottom the trail passes the entrance on the right to the Turitea dams. Cross the bridge and follow the road for about 200m and then turn left into a track that follows the stream for 20 mins. It exits at a road bridge on Ngahere Park Rd. Cross this, then a sort distance down turn left into Turitea Rd. After a one-way bridge a track begins again by the stream at right before joining the road once more at another bridge. Turn right and later cross over along the road when a gravel path on the left emerges. This takes a turn down what looks like a private driveway before the road begins to go up a hill. The path emerges on Old West Rd. Cross the road to pick it up again and climb up a short set of steps onto grazing land used by Massey University for farm animal research and from which there are views of the university’s Sports Institute. The trail continues through open parkland, play areas and alongside bush streams. A short side trip can be taken into the Massey Aboretum after climbing down the stepped terrace where good views over the picturesque Massey University Campus are seen. The trail follows the Lower Turitea Walkway, a well-formed pathway with 3 footbridges over the Turitea Stream. You end up walking through Bledisloe Park to exit on Tennent Drive, just east of the main entrance to Massey University. Follow the road east and cross it at a suitable point in order to be on the western side of Fitzherbert Bridge when you traverse it over the Manawatu River. On the city side at left is the Esplanade, an extensive bushy park with pond, play area and the like. There is a drinking fountain and toilets by the play area near the car park close to Fitzherbert Ave. Buses into the centre of town stop around here too. Further into the park is a pleasant café. Palmerston North Holiday Park – 133 Dittmer Drive, some distance from The Square and supermarkets, but has a good variety of cabins and ample tent sites, 06 358 0349, 06 358 0349.
Pepper Tree Hostel (BBH) – 121 Grey St, north of The Square, 06 355 4054, 06 355 4054. Achilles Court Hostel – 42 Achilles Crescent, 06 354 1127, 06 354 1127. Railway Hotel Backpackers – 275 Main Street, south-west of The Square, 06 354-5037, 021 144-0896. Whiowhio Hut – 20 Dorset Crescent (adjacent to the riverside walk), 027 470 9829. Urban tramping hut. Kitchen, shower, laundry, bikes and electricity. Payment by koha (donation). Hosted by Te Araroa walkers and whio (native blue duck) enthusiasts Anthony and Fiona (aka Whinny and Whiona). Pak’nSave supermarket is on Fitzherbert Ave, just before The Square on the left; Countdown is more or less on the other side, but hidden within The Plaza mall, accessible from Ferguson St or Church St. And there are a variety of Asian food stores all about 2-500m from The Square: Hana Mart, 199 Cuba St; Jia Hua, 517-525 Main St; Dong Shen, 78 Rangitikei S; Moshims Discount House (Middle-Eastern? ), 401 College St. This route from Palmerston North towards Whanganui (also spelt Wanganui) is mostly road walking. Much of this is on long, straight country roads. Traffic is not dense but drivers in these parts can go very fast and there is little shoulder here. Wear something highly visible and walk on the right-hand side, facing traffic. Also note that because the route sometimes follows closely parallel roads, or routes just off the roads, it is not possible to tell from the resolution of the TA maps exactly where you should be walking at times. These notes provide a better guide on the section from Palmerston North to Feilding than the maps. The route starts at the Fitzherbert Bridge over the Manawatu River and goes along the popular Riverside Walkway. You can get to the bridge from The Square at the centre of town by taking one of the buses that go to Massey University or the suburb of Summerhill. They depart from Main St on the north-western side of The Square (bus 12 or 14, not the less direct 12A). There is an information centre just within The Square opposite the bus station. The buses you want run down Fitzherbert Ave. Get off after Te Awe Awe St but before the bridge. Start walking at the town end of the bridge on the eastern side along the sealed path that follows the river. On the western side is The Esplanade, with toilets, should you need them. At one point the path takes a large loop to the left, following the stopbank, but you can save a bit of time by taking the rough track that follows the river and later joins the sealed path. The path ends at Riverside Drive. Turn left into this via a car park. This later becomes Roberts Line, which you follow for about 4.5 km. First it crosses the main road to Napier and goes through suburban Kelvin Grove. There is a large Countdown supermarket on your right at Fernlea Ave. As Roberts Line approaches a low hill it seems to turn left into Mcleavey Drive, but keep going straight ahead up Lydia Place and then a short path to Kelvin Grove Rd on the crest of the rise. Continue on along Roberts Line on the other side. When you get to the rail line, turn right before crossing it into what looks like a private drive through a farm gate and follow the line of trees parallel to the rail line. Keep going in the same direction over farm land through more gates and over stiles, always staying near the fence line running beside the railway. Eventually your path becomes Sangsters Rd. Then turn right into Cleverly Line and left into Stoney Creek Rd. Soon you will reach the settlement of Bunnythorpe. It is known for its electrical sub-station that supplies the lower central North Island (visible off in the distance at right as you approach the village) and the historic Glaxo factory beside the road at your right. This was one of the origins of the large British pharmaceutical company GlaxoSmithKline. There is a dairy, toilets and a takeaway bar on your route through the village. A drinking fountain is hidden behind the toilets. Turn left and cross with the Kairanga-Bunnythorpe road over the rail line and then turn right immediately on the other side. You are now on a gravel road but this runs out quickly. Keep going straight ahead, parallel with the rail line, through long grass and weeds. You will come to a crossing over Jacks Creek comprising concrete rubble. Then not far on is Mangaone Stream. Go left downstream 15 or so metres for another crossing point over rubble. Watch the first chunk of concrete – it is very wobbly! You should achieve both crossings without getting wet in normal flows. With higher water levels these will still be the best places to cross. You next come to the Refuse Transfer Station. Squeeze round the side of its fence and onto Waughs Rd that leads from the station. After 2km you reach a complicated intersection and rail crossing in one. Turn right over the line then left into Campbell Road to again put you walking beside the rail line on the less busy side – but on the north-east side this time. There is a bit more road margin than Roberts Line but traffic still goes very fast. Pass by Taonui (Feilding) Aerodrome on your right. There are public toilets by the car park here. Campbell Road is a long stretch but as it eventually turns to the right there is a crossing over the rail line on the left to bring you to a concrete footpath beside the main road into Feilding. After 1 km take South Rd diagonally off to the left. And if you are headed into the centre of Feilding turn off at right on Manchester St. You will smell the Feilding saleyards as you pass them on the left close to the centre. Farm animals are bought and sold here on Fridays and it is worth catching the event if you are in town on the day. Finding somewhere cheap to stay in Feilding is a bit of a problem. There is a motorcamp (Feilding Holiday Park, 5 Arnott St) but it is about 4km north-east of the trail route. It does have bunkroom beds though. There are a couple of old hotels. The cheapest is the Denbeigh but at $50 a single it is grossly over priced (peeling wallpaper, no curtains, no towels, window that wouldn’t stay open in my room…) The Mahoe b&b as you enter South St is about $100 and is on Airbnb. There are some other cheap places on Airbnb too. If you are searching for Feilding on the internet, note the ‘ei’ spelling – not, as you would expect in the English language, Fielding. There is a large New World supermarket rather hidden off Fergusson St to the south-west of the Denbigh Hotel, and many moderately priced restaurants and takeaway food places all centred around the square and its offshoot streets. A generous meal can be had for $13.50 at the Sushi House Restaurant at 106 Fergusson St (it closes around 7pm). Keep going along South St until it meets West St. Turn right into that, then left after 300m onto Ranfurly Rd through some leafy residential housing and onto the top of the hill. The road then comes down to meet Sandon Rd, where you turn left to head west. It is a 6 km stretch of reasonably busy road to Mt Biggs School. Turn right here into Mount Stewart–Halcombe Rd and then left into Ngaio Rd. The traffic seems to lighten up from this point. About 2km along is the Mt Lees Reserve. There are toilets here and a tap with drinking water. Also a pleasant shelter (summer house) with a small kitchen attached. You could easily make a cup of tea here and you can camp adjacent to it. There is also a B&B in the homestead. The cheapest rates are $60 single and $90 double. It looks like a nice place to stay. 06 329 3938. 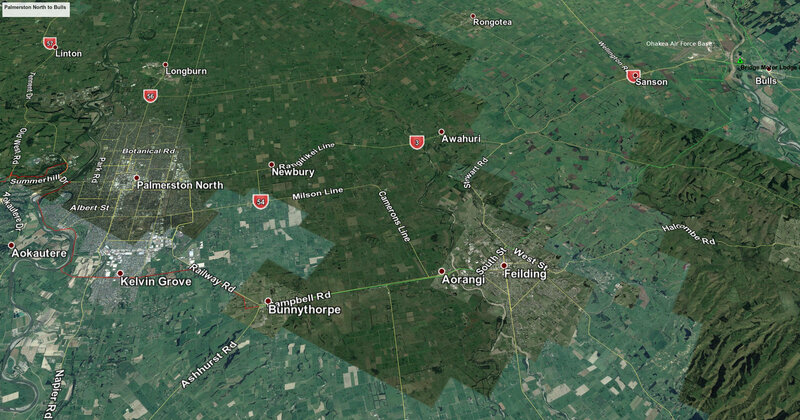 Continue on another 2 km to the Air-force’s Ohakea aerodrome radio station. Turn left here into Wilson Rd. Note that the gravel road that continues in the direction of Ngaio Rd down towards the river is not public access all the way. It used to be the TA route but is no longer. The route along the river is difficult going anyway. Three km down Wilson Rd turn right onto the gravel Hurst Rd, and then left into a pleasant sealed road, Wightman Rd. This brings you to the State Highway and the major bridge over the Rangitikei River when you turn right. There are plenty of places to eat in Bulls as it is a transport junction, but not so much accommodation, though there is the campground as you come in and Lancewood Lodge as you exit. There is a smallish Four Square supermarket at 114 Bridge St (closes 8pm), and free wifi at the public library on SH1 heading north, with its distinctive WWI roll of honour entrance. Bridge Motor Lodge and Caravan Park – just over the bridge at 2 Bridge St, 06 322 0894, with tent sites and great value backpacker bunks. Lancewood Lodge – 170 High St, Bulls (on the trail, about 600m from the intersection that marks the centre of Bulls). Has a number of accommodation options including tent sites ($10 + $10 for access to showers and lounge), bunkroom ($23) and private rooms ($42pp). 0274 269994 (Jo) or 022 1996497 (Rhys).